With an unbeatable combination of warmth and moisture wicking performance, the Merino Seasonal Sock stays comfortable over a wide range of temperatures. The lightweight Merino wool is also soft against the skin and naturally odor resistant. Additional features include a mid-foot support band. 6 inch cuff. Available sizes: Medium, Large and X-Large. Quite comfy and the perfect weight for all but the coldest days (I'll be wearing booties then anyway). I like the calf height on these as well. Nice and stretchy compared to some wool socks. I haven't really had them long enough to comment on their durability. I will probably be buying more of these. These socks are great! A really nice weight, height, and nice and snug without being restrictive. I have worn them them in summer heat and fall conditions with perfect results in both. If you like a crew sock and are a fan of merino, then these socks really do outperform the competition. Comfortable and warm. Nice and tall for those cold days. Prior to purchasing these socks I used just regular cycling socks but my feet were cold when the temperature got down in the 30's. I tried these socks because they were Merino wool and reasonably priced, what a difference. My feet are now warmer and drier, and long winter rides are much more comfortable. I bought a pair of these socks last winter and like them so much I recently bought two more pairs for me, and one for my wife. The only reason I am giving these four stars instead of five is that the pair I bought last year is already starting to get a little thin in a couple of areas near the toes. Aside from that I have nothing but raves. Had been looking high and low for a plain white merino sock. Found em! Unfortunately not as stretchy as they should be and already developed holes in the toes. bummer. Wish they were more durable. Still I bought several pair since the all white wool is unique. This sock is of good height and solid construction, yet lacked the thickness( comfort) of other wool socks from Giro. Definitely not as warm as the other socks either. Will be great for transitional weather conditions. Decent quality and good value. Decent merino sock at perfect weight for both cycling and work days. Stylish but understated to work with most kits. Seem to be wearing in the heel fairly quickly, but all the merino socks i have wear faster than typical syntheticcotton blend socks. Got the charcoalwhite dots and they've quickly become my favorite socks. Haven't tested them below 50F but between 50F and 85F they've been perfectly comfortable (haven't tested them higher yet). As others have said, they're thin so I wouldn't trust them for running. I've also noticed myself choosing these instead of bland work socks for a day at the office. Definitely going to grab another pair or two. Poor quality, wear out immediately, don't buy. All three pair purchased wore through the heel and had to be trashed. Purchased a pair of these for my boyfriend for Christmas and he loves them. They are not just warm but stylish too. I own seven pairs of these socks, and have used them for fall, winter, spring, and summer riding. The idea of rocking wool in warmerhotter weather might seem counterintuitive, but wool insulates as well as any synthetic and Giro's midlight weight weave helps prevent sweaty feet. The lightmid weight material also ensures that your shoes fit properly-a nice contrast to thicker socks that crowd space in the toebox and cause blisters or hotspots. What about cold weather? Again, the lighter weight weave allows for proper circulation and prevents your feet from getting clammy. If it's chilly enough, you need to insulate on the outside of your shoes with booties. 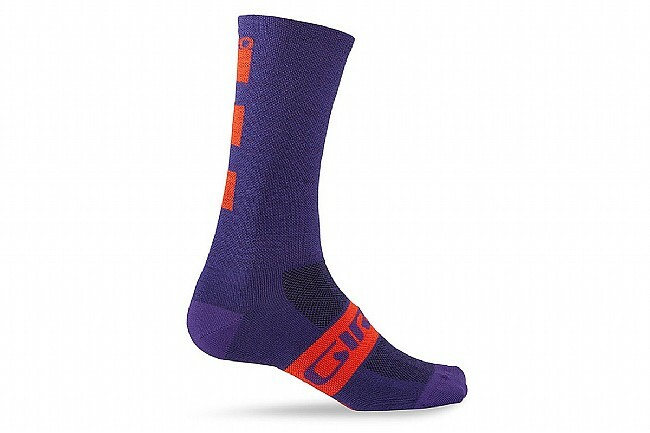 Lastly, Giro's merino wool socks fit true to size so long as you wash and dry them properly. Never use hot water or air (unless you need to shrink-fit them). Nice socks. I had forgotten how great it feels to wear wool. A nice pr of wool socks for a cool day of riding. Nice warm, breathable, low odor wool socks. If you have not tried wool socks for some years, you should try these. Bought these socks on sale and they keep my toes warm in the high 40's. I am not sure how it would stand when it gets below 40 so can't comment. But so far they are great and comfortable. Only issue issue that I have is very minor. The heel starts to wear off in a couple of uses. These socks have just the right weight and height for winter riding. My feet are happier with wool round them than synthetics. Wool seems to be cooler in the summer and is definitely warmer in the winter. Plus the mid-weight is just perfect for fitting inside all-season shoes, you could get thicker socks for warmth, but they will bind inside tight-fitting shoes, limiting circulation, thereby making feet feel cold. I try to avoid feeling cold. They fit nicely and have a good shape. I got the XL size for my size 12.548 feet and the heel falls right where it should. I did, however, expect them to be a thicker sock. I now know what seasonal mid-weight means.